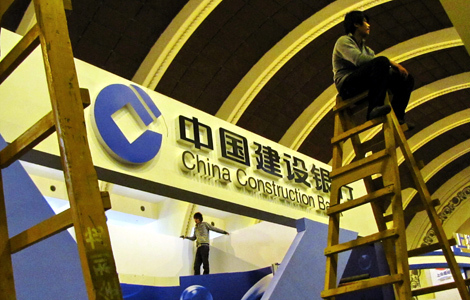 A China Construction Bank booth at an exhibition in Shanghai. Sources say the Chinese lender has made a preliminary bid for control of PT Bank Maspion Indonesia. [Photo / China Daily] Stronger currency will help in fight against inflation The ongoing debt crisis in the US and Europe may force China to move faster on..
A China Construction Bank booth at an exhibition in Shanghai. Sources say the Chinese lender has made a preliminary bid for control of PT Bank Maspion Indonesia. [Photo / China Daily] Shareholders reported to be selling 50% of company to a strategic buyer HONG KONG / SINGAPORE – China Construction Bank Corp (CCB), the world’s.. US debt crisis, weak dollar to dent export earnings The sovereign debt crisis in the US will affect exports from China as the US is a major destination and a major market for Chinese exports. 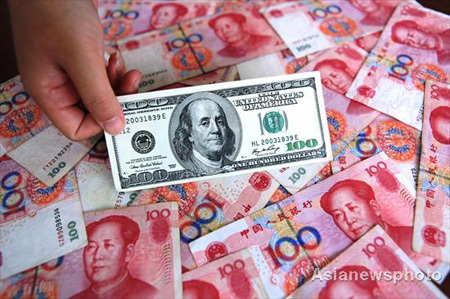 With most of the export earnings being in the form of US dollar payments, a weakening of the greenback will..
BEIJING – The Chinese currency Renminbi, or the yuan, gained 19 basis points to a record high of 6.3972 per $1 on Friday, according to the China Foreign Exchange Trading system. 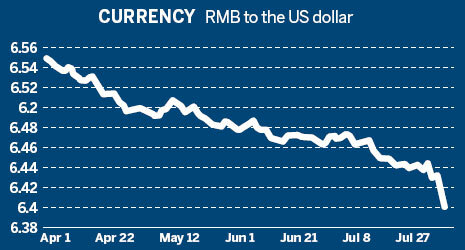 In China’s foreign exchange spot market, the yuan is allowed to rise or fall by 0.5 percent from the central parity rate each trading..
PBOC wants to see an increase in loans to the most vunerable sectors BEIJING – China’s new-yuan lending fell sharply in July to 492.6 billion yuan ($77 billion), the lowest level for seven months, because of the nation’s monetary tightening measures, but analysts said the policies will be fine-tuned in light of the current global..
BEIJING, Aug. 13 (Xinhuanet) — The U.S. and European debt crises continue to trigger chain reactions across the world, spreading radical fluctuations in the financial markets. Despite a recovery at the stock market, China still faces challenges in dealing with the current financial storm. Although far from the center of the current global financial storm,.. The China market is increasing over the years and many foreign companies are considering about entering into China. However, many have heard about the downside of failed China market entry and are worried about the complications of the China market. But as long foreign investors learn and understand more about the Chinese business culture and..
Official Name – The People’s Republic of China Population – ~1.3 billion* Official Language – 7 main Chinese languages including standard Chinese or Mandarin, Cantonese. Currency – Yuan (CNY) also referred to as the Renminbi (RMB) Capital city – Beijing GDP – RMB 39.79 trillion in 2010 GDP Per Capita – RMB 29,748 in 2010*.. Welcome to BID Consulting Group.